Carol L. Gillam of The Gillam Law Firm, and Anna Y. Park, Regional Attorney for the Los Angeles District Office Equal Employment Opportunity Commission, Los Angeles. November 5, 2009 – The Employment Roundtable of Southern California (“ERTSC”) will hold its 2009 Annual Conference on November 5, 2009, at the Westin Bonaventure Hotel in downtown Los Angeles. The address is: 404 S. Figueroa St, Los Angeles, CA 90071. 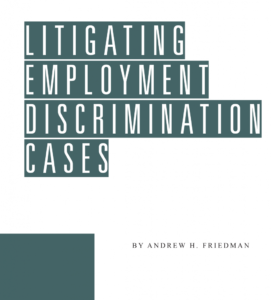 Mr. Friedman will appear on a panel discussing disability discrimination with Erica Jones, Director, Pacific Disability & Business Technical Assistance Center and prominent defense counsel Anthony J. Oncidi of Proskauer Rose LLP.